Back in 1975 reservations had to be made either by post or in person or through an accredited travel agent. 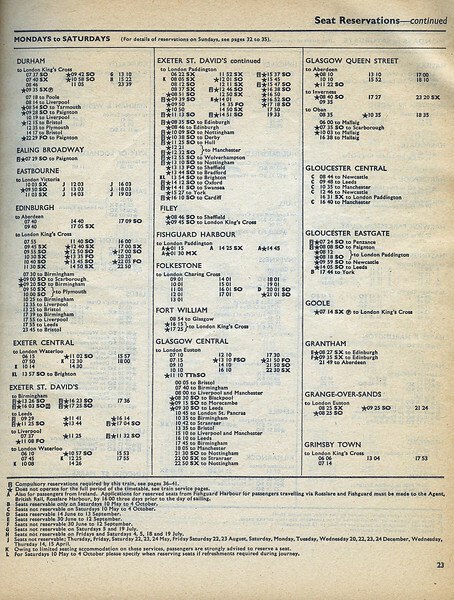 This is just a sample page, you could seemingly reserve seats to and from a lot more places than you can now, imagine turning up today at Filey and trying to reserve a seat to King's Cross! Some of the footnotes are intriguing, I particularly like L, about specifying whether you want to take refreshments on the SO Exeter to Brighton service, which was made up of a pair of Hastings DEMUs, a 6S or 6L (class 201 or 202) and a 6B (class 203). Presumably if you wanted refreshments you would get a seat in the 6B which included the buffet car.